The Annin Windsock is an excellent product and very unique. 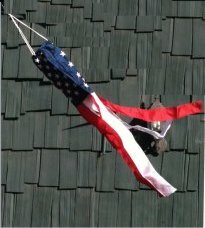 I'm proud to fly it in my front yard. and yes--it has 50 stars. One of the great things about it is that it waves in very light breezes.The Nyl-Glo nylon is super durable and colorfast. My windsock has been out there a year and still looks fantastic.